Is Your Local Kia Dealership Overcharging Customers on the 2018 Stinger? Kia’s first-ever true sports sedan, the 2018 Stinger, is making a splash in the auto world. Totally unlike any other car made by Kia, the Stinger is fun to drive and beautifully styled. Its sensational performance capabilities and graceful exterior styling make it hard to overlook. Both automakers and car fanatics are falling in love with the Stinger, and it’s captured the attention of sports car aficionados across the country. One reason the 2018 Kia Stinger is fast becoming America’s favorite sports car is its price. Created as a more affordable alternative to the sports cars produced by Audi and BMW, Kia made a beautiful, speedy vehicle available at a price anyone could afford. However, the Stinger is embroiled in a price crisis: customers are discovering that the Stinger is far more expensive than they expected. Shockingly, some Kia dealerships are overpricing this highly anticipated car. This means Stinger shoppers need to be exceedingly careful – and you need to know your facts before you buy. Here’s how you can drive home a new Stinger without paying extra. The 2018 Kia Stinger is an excellent substitute for a pricey two-door sports car. It’s versatile too: despite its speedy and sporty design, it’s hiding a family-sized interior inside. Very few modern sports sedans can match the Stinger’s value. Its included features match up against more expensive rivals like the 2018 Audi S5 Sportback and the 2018 BMW 430i Gran Coupe. Of course, performance is one of the Stinger’s biggest selling points. With 255 horsepower and 260 pound-feet of torque, the base turbocharged four-cylinder engine will appeal to the drivers who’re looking to save fuel without sacrificing speed. Serious thrill seekers won’t be able to resist the exhilarating GT model. Its turbocharged V6 engine churns out a formidable 365 horsepower and 376 pound-feet of torque. With a scorching 0-60 time of around 4.5 seconds, the Kia Stinger GT outshines any typical sedan. Along with its quick acceleration, the Stinger offers tight handling, with adaptive suspension dampers and a variable-ratio steering system that enable you to rip around corners. 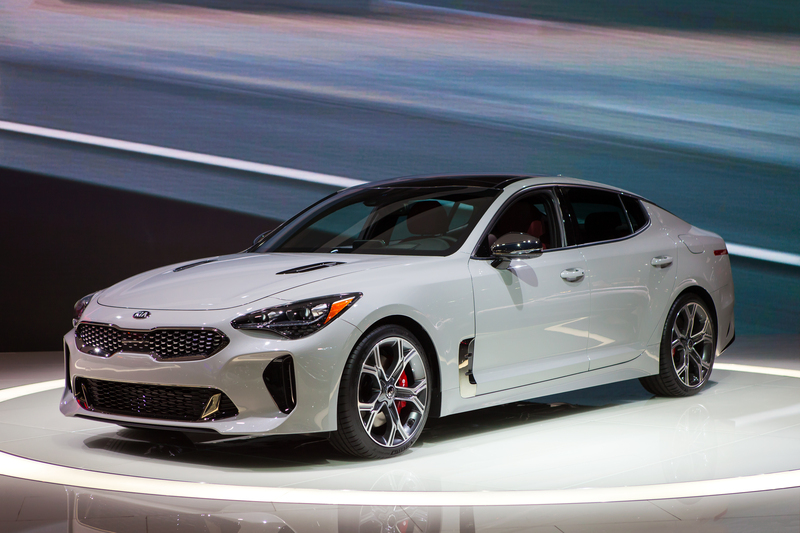 Is Kia Making Dealerships Mark Up the Stinger? Unfortunately for Stinger fans, this new car’s popularity is the biggest reason dealerships are marking up prices. According to Jalopnik, countless new car shoppers have experienced sticker shock – they headed to their local Kia dealership expecting to buy a Stinger priced around $50,000. However, they discovered that their dream sports car was suddenly $5,000 more than Kia’s MSRP. Jalopnik reports that these dealerships told customers that Kia mandated these crazy markups. At numerous dealerships across the country, hopeful Stinger owners were told the same thing: that Kia insisted that dealerships overprice their newest vehicle. But you shouldn’t blame Kia for these markups on the Stinger. You should blame the dealerships. In an effort to take advantage of the Stinger’s massive popularity, some local dealers are inflating the car’s price. They realize there’s a big opportunity to bring in more money. According to Kia, the auto company doesn’t encourage or mandate that dealerships add thousands of dollars in markups. In fact, a Kia spokesperson stated that the company “actively discourages dealers from marking up prices” beyond the MSRP. If you’re finding 2018 Stingers selling for over $50,000, you’re being overcharged. Although the 2018 Kia Stinger is definitely deserving of its hype, you shouldn’t have to pay thousands of dollars just so the dealership can make some extra cash. And you don’t want to buy a car from a dealership you can’t trust. Fortunately, not every dealership is looking to scrub its customers for extra money. Some take great pride in offering competitive pricing. From the comfort of your own home, you can compare the prices of various dealerships; an online search will help you determine who has the best deal. Make it a priority to only do business with dealers who offer fair pricing. Do your homework before you buy a new Stinger. Make sure you know which local dealers are offering fair pricing. Connect with Kia experts and fans online – you can learn a lot of inside info by reading an online Kia forum. The members will be more than willing to help you out and direct you to dealers offering the new Kia Stinger at invoice prices. There’s even a “Naughty Kia Dealer List” that reveals the dealers who continue to add mark-ups to the new Stinger available online! Just remember that you should never buy the first car at the first price you see. You could become the victim of a markup scheme – and you could waste thousands of dollars.